Platte M- / Cover vg++ (siehe Bild)! 6 euro BITTE RECHNUNGSTELLUNG ABWARTEN! 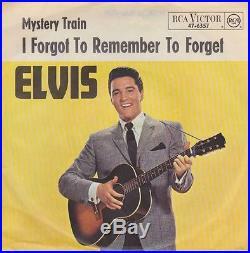 The item "ELVIS PRESLEY Mystery Train Orig. D RCA 47-6357 PS Single M- DEVIL COVER" is in sale since Saturday, July 15, 2017. This item is in the category "Musik\Vinyl\Rock & Underground\Rock 'n' Roll". The seller is "be-sharp-gmbh" and is located in Bruchsal. This item can be shipped worldwide.